I discovered Purse Paradise a couple of years ago, and I immediately ordered some pretty needles, some thread, a brooch pattern, and strings of beads. I decided to make a necklace rather than a brooch, so I adapted the pattern a bit and knit just the front of the project, making a flat piece instead of a bag. It came out okay (it's the one on the left; click here for a bigger image). 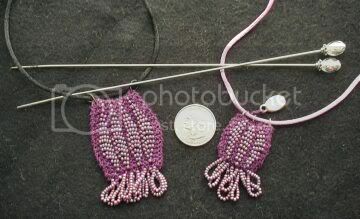 However, I forgot to take the "stretching factor" into consideration: cotton weighed down by beads will, uh, stretch. Duh. So I wore it a few times, and it grew. And grew. And eventually I tucked it away in a drawer. The great thing about making these little bags (or brooches) is that they knit up quickly (even on the tiny needles) and that they are inexpensive to make. For about $20, you can get enough supplies to make a pile of them. And I thought that knitting with beads was fun. I would like to find some time to design some other amulet bags. *The second necklace has a a bit of a backstory. Last June my husband had to have a serious and very invasive surgery. During the hurry-up-and-wait period prior to the scheduled date, I decided to make an amulet bag that I could wear during his surgery. (I am not usually superstitious, but it's amazing what fear will do to a person.) When the bag was completed, I attached a tiny silver bead with the word "believe" on it, and I tucked it inside. It was perfect. And then--much to my dismay--I forgot to wear it to the hospital on the day of his surgery. Thankfully, all went well and he is now fine, and the bag will always have a special meaning for me.